Convergent Design's Odyssey7Q+ is a monitor recorder that provides all of the features and functionality of the Odyssey7Q but adds support for 4K recording over HDMI. It features a 7.7", 1280 x 800, OLED, touchscreen display with a 3400:1 contrast ratio, true blacks, and professional monitoring features such as waveform, histogram, vectorscope, anamorphic de-squeeze, and 3D LUT support. Out-of-the-box, the Odyssey7Q+ can record up to 4K (4096 x 2160) and Ultra HD (3840 x 2160) in the compressed Apple ProRes 422 HQ format or up to 2K/1080p using the uncompressed DPX file format. 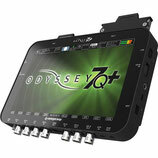 The Odyssey7Q+ monitor recorder is capable of recording and processing video at high speeds. With high frame rate (HFR) recording the image can be reach new heights of clarity and smooth motion, or the frames can be played back at standard speeds to create slow motion. High frame rate capabilities are camera system and resolution dependent. The Odyssey7Q+ never “creates” frames, only captures them, so a camera must have an output for a high frame rate in order for the Odyssey7Q+ to record it. Contributing to the power and versatility of the Odyssey7Q and Odyssey7Q+ is the ability to display and route 3D-LUTs. Signals with 3D-LUTs applied can be displayed on the OLED, measured on the Image Analysis Tools and output over HDMI and/or multiple SDI outputs.